What is it? Rotis is a videogame created essentially from scratch by DeProgrammer. I say "essentially" because computers, electricity, and music-making, sound-making, graphics-making, text-editing, and code-compiling programs were all needed to create it. (Yes, that's right: DeProgrammer made the design, music, sound effects, graphics, website, AND code for this particular game! He might even advertise it!) Also, DeProgrammer made a 2D OpenGL template program before, on which he based Rotis, and the template he made was based on an OpenGL wrapper made by Guy Perfect. And finally, DirectX 7 is being used to play the music, although that may be changed in a later version of the game. A video of its creation, up to a certain point, can be found here. Also, the music part of that video in higher detail is located here, and the graphics section in higher detail can be found here. How about actually describing the game itself? Well, Rotis is a puzzle game played on a 7x7 grid full of blocks. The object of the game is to move the rocks into the portals. Rocks cannot be moved manually; rather, they must be moved by making matches. 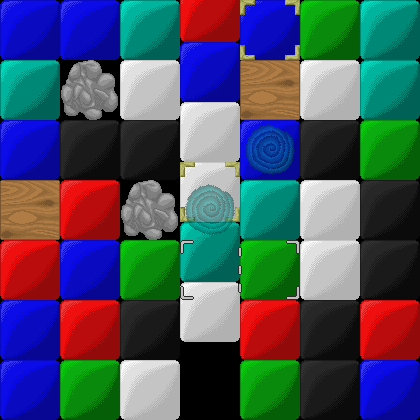 To make a match, one must arrange the tiles via the block swapper such that three or more of the same color are touching in a row or column. If any wooden blocks are making contact with the match, or if any wooden blocks are making contact with those wooden blocks, they will pop as well. Blocks with golden brackets change color every time the play area rotates. After a match or chain of matches (matches caused by other matches) is finished, the play area rotates a quarter turn. The play area will also rotate if 10 seconds pass without a match being made. If not all of the rocks have been placed into the portals after a certain amount of time, the player loses. Can I redistribute this? If you wish to spread the word about Rotis, please link to this page. Don't just send other people the ZIP or program files. This description is here for a reason! What programs did you use and where can I get them? Here are the programs I used on this project: Microsoft® Visual Basic® 6.0 (for coding), InkScape (for the logo), Microsoft® GIF Animator (for the animation), Kinesis Animator (for the animation), sfxr (for sound effects), Anvil Studio (for the music), Microsoft® Paint (for a lot of things, including making the blocks), Paint.NET (to resize the logo with antialiasing), and VirtualDub (video recording and editing). I also used Microsoft® Windows® XP Professional and Mozilla Firefox (browsing), but I'm sure all users have one or both of those (or an acceptable substitute), or else they wouldn't even be seeing this page right now. I have a problem! If you have difficulties opening the program, check out the Christian Kinesis main page for dependencies. If that doesn't solve your problem, send us an email! Also, if the graphics appear as a bunch of white boxes in the Windows Vista®/Windows 7® version, press F5 to reload them. I encourage you to donate a few dollars if you enjoyed Rotis. If you didn't, I'm quite sorry--I thought I had done a fine job in making it fun. :) And either way, you might be interested in checking out the rest of my site. Click the image below to visit the main page. Christian Kinesis (or the creators of each individual item listed on this page and not credited to a third-party) provides each product "as-is" with absolutely no warranty, to the extent permitted by applicable law. Neither Christian Kinesis nor any of the creators involved will in any case be liable for any damages caused by the provided products. Windows, Windows Vista, Microsoft, and Visual Basic are registered trademarks of Microsoft Corporation, which neither endorses nor is affiliated with Christian Kinesis or DeProgrammer. Also, this specific program is not the property of Christian Kinesis, but is the sole property of DeProgrammer, in the event he'd like to get financial income out of his years of hard work and learning. This page was last updated November 26, 2008.